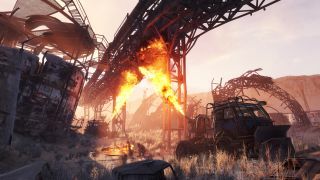 Metro Exodus has just released a major update which adds a new game mode and makes a number of changes across all platforms, including better support for RTX graphics cards and DLSS on PC. The so-called Ranger Update for Xbox One, PS4 and PC weighs in at around 6GB, and as mentioned it has introduced a ‘New Game +’ mode, which allows you to play through the game again after you’ve completed the campaign – except this time, you’ll have access to all weapons and attachments you unlocked in your previous run through. Furthermore, this mode allows you to play with a load of variables to fully tailor the gameplay for your own “personal and uniquely challenging experience”, in the developer’s words. It also has its own fresh achievements and trophies to be won. And as an added little bonus, you can also enable developer commentary in this mode, which scatters tapes around the game that you can find and play, in which members of the dev team discuss the level design in the areas where these nuggets are found. PC gamers who have bought one of Nvidia’s new RTX (Turing) GPUs will doubtless be pleased to hear that Metro Exodus now has better stability when ray tracing is enabled. Furthermore, DLSS has been improved with the game. This is Nvidia’s frame-rate-boosting tech for RTX graphics cards which also peps up the visuals, and according to the patch notes, DLSS image quality is now better overall. DualShock and Steam Controller support has now been added on the PC, as well, plus overall controller responsiveness has also been improved in Metro Exodus. That includes the addition of a fourth sensitivity preset, and improvements to aim assist to boot. Xbox One players get mouse and keyboard support, too. Naturally, there are the usual ton of bug fixes which have been applied, with a lot of crashing issues having been solved, and the developer promises a “big improvement” to overall stability in this update. Head over here to read the full PC patch notes, which detail all the various minor tweaks and bug fixes that have been applied. Metro Exodus got off to a very shaky start, particularly on PC, but fixes for GeForce RTX graphics cards and DLSS issues were quickly introduced, so hopefully these further smoothing-over measures should help to make the game much more playable with these Nvidia GPUs.